We all have some sort of guilt concealed within ourselves. We try to be better, improve our lives, wash our vices, and hope to rise again. But our guilt drags us down. It doesn’t let us grow. 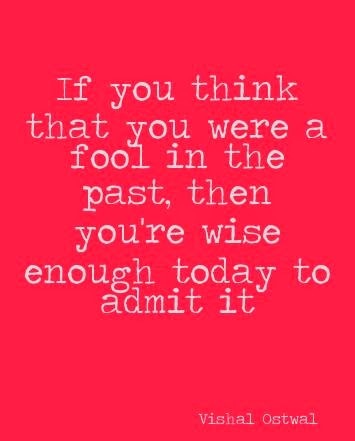 It reminds us that we’ve already been fools throughout and there’s no hope of getting back our lost life. But the only thing which our guilt is capable of is doing is ruining our future by stopping us from becoming who we want to be. You may call it the brother of guilt. Regrets about what we’ve done, regrets about what we should’ve done, regrets about what we didn’t do. Regrets, regrets, regrets! We need to get rid of regretting. Because cursing the past us isn’t going to make our future us any better. It is better to accept that we are at some perfect place, and we can still go on. Whatever or whoever you are, forgive yourself. Perhaps you’ve done something bad, betrayed someone, failed in your duties, never became a perfect human, or have done wrong things. Even if others may or may not be aware of your sins, you know what they are. You cannot move further until you decide to be better. You can only move forward on your way by leaving behind the burden of sins by forgiving yourself. Whether you take failures seriously or not, but escape the guilt of failures. Everyone fails at something (I know you know that), because ultimate perfection is hypothetical. Everyone is good or bad at something, and hence failure is simply inevitable. Above all, remember that even if you think you’re among those who deserve being imprisoned, are perfect for hell or the ones who should be abandoned by everyone to suffer alone … as long as you’re willing to become a better someone, just know that your guilt isn’t justified. People will keep scratching your wounds. They’ll remind you about your weaknesses and make you recall your ruined past. Don’t suffer, but rather know in your heart that God watches everything, and he is the one who will accept you and forgive you. But till then…forgive yourself, while you’re alive. The guilt and pain that we feel may be justified by us, but it doesn’t make us any better. So it makes sense to forgive the past you and live for your future you.